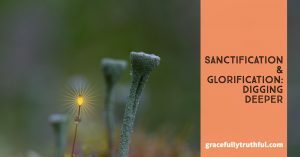 Check out Sanctification & Glorification! 1) What is happening in this passage? Who is the audience? 2) What is “discipline” in this context? 3) What does it mean to “fail to obtain the grace of God”? 4) Who is verse 17 referring to? The book of Hebrews was written just a brief 30 years after Jesus was crucified, resurrected, and returned to Heaven, which means the New Testament church was spreading like wildfire, but was extremely young. Letters were being sent to new, budding churches to teach them theology and sound doctrine from his disciples who had walked with Jesus, studied Him, and knew Him the best. Hebrews was written to Jewish Christians with a heavy focus on doctrine and is rich with theological ties back to the Old Testament (which would help Jews see Christ’s big story of redemption for mankind in their own heritage). This particular passage hones in on a true believer’s growth, seeing discipline as a benchmark for being a genuine believer. Because of my abusive upbringing, I automatically associate the word “discipline” with punishment, severe consequences, and a complete lack of loving relationship. In essence, discipline was a distancing in relationship because I didn’t measure up. But this isn’t the context of this word. The Greek for “discipline” is “παιδειαν”, which carries the meanings of “nurturing, training, educating, and cultivating the mind, body, and soul, while also correcting mistakes and curbing passions.” So Interesting!! To get a better idea of this meaning, read the passage through again but substitute “training” instead of “discipline”. This phrase follows a few sentences of actions for the believer to take: encouraging others, sticking with true doctrine, and living at peace with those around us. Read out of context, it can look like we are being asked to simply “do” good works, but the author points us quickly to truth: it’s about grace. A grace we can do nothing to make our own. A holiness we can never attain, but both of which are necessary for eternal security. To “fail to obtain” that grace isn’t about things we do, but about trusting Jesus Christ to be our righteousness. If we are not bound up in that grace, everything we do is meaningless and will not last into eternity, including our own souls! Sisters, this is a matter of life and death! Verse 17 references Jacob and Esau, twin brothers from the Old Testament who fought constantly. Jacob, the younger brother, was clever and used his quick thinking skills to outwit his short-tempered older brother. Jacob tricked Esau into handing over his “birthright” for a bowl of stew as well as deceiving their father, Isaac, into giving him the blessing reserved for Esau. Esau longed for his birthright, even though he had callously given it away for temporary satisfaction, but his regret came too late and what had been done could not be undone. Knowing the audience that a portion of Scripture was written to can be of great assistance when we are trying to understand and correctly apply God’s Word to our lives. Just because something is written in Scripture doesn’t mean that it applies the same to you or me as it originally did to its first audience. Because Hebrews was first written to a Jewish audience, many of what is said would have held greater meaning to them than to us. But we can join in, and with just a little bit of digging deeper, we can capture the same meaning! I’d like to challenge you to read a chapter of Hebrews each day (it’s only 13 chapters!) and pay close attention to those tiny letters next to some of the words. Those are cross-references and in the margin of your Bible, they link back to another verse that will help you have greater understanding about that passage. Take time to invest and look up some of those references! You won’t regret it! A much better image than distancing a relationship through punishment is to consider the slow, but persistent training of an exercise regimen. You start lifting 5 pound weights or walking for ½ mile, but as your endurance and ability grow, you can lift heavier weights and eventually run a marathon! 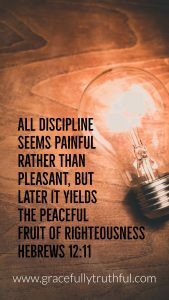 This idea of discipline encompasses not just the “spiritual”, but the whole being to include your mind, your education, your heart, emotions, and your very soul. It’s definitely a growing process and growth means change and change is hard. Life is hard. But through every single moment of every single day, yes that means right now and the one where your spouse was angry and the one where you yelled at your children and the one where you heard that rumor, those. All of them. The Lord is willing to work in the middle of them, to train your heart, soul, mind, and body about righteous living. This Is Great News!! What do we have to do? Just lean in to His training! Bottom line: this line is about you and me and what happens when our physical hearts stop beating and our lungs stop breathing. If today, while we are in the ‘now’, we fail to obtain the grace of God, we have no hope. Utterly destitute, we will spend all of eternity apart from the beautiful relationship we were created to enjoy. Girls, it is not worth it! The surrender of ourselves is a significantly small price to pay to enjoy the full, sweet treasure of an intimate relationship with the Almighty! Who are you trusting in this moment? You? Your spouse? Your parents? Your pastor? Your good deeds? Or the Lord God, who longs to lavish you with abundant grace?! Though the passage refers to Esau, the implications are meant for every recipient of the letter of Hebrews as well as us. How quickly are we willing to trade the temporary satisfaction and pleasures of this life in exchange for our eternal souls and the “birthright” for which we were created: an intimate, full relationship with the Lord? It may seem worth it in the moment to live for what we want, live our way instead of God’s, but in the long run, we are trading all of glory for rubbish. Choose Jesus now, my precious friends! Though it cost all you have, choose Him now! Thanks for joining us today as we journeyed into Creed Week One! See all past studies in Creed!